Proclaiming a decentralization policy, the authorities did not hide the plans to “draw” a new map of Ukraine. Obviously, the ruling political forces hoped that this would help them create a new electoral map, form new local elites who would be guided by the central leadership and follow the logic dictated by Kyiv in everything. The focus of decentralization was made on the creation of new united territorial communities, leaving the problems of other levels of local government behind the reform. This is what deputy chairman of the opposition bloc faction wrote in his blog for the "Correspondent". All this was accompanied by an abundance of slogans and talks about the solvency and independence of new communities. In practice, the process ends exactly the same way as all the previous initiatives of the new authorities — failure. We received a new “map” of social, property, budget, legal and political conflicts. In financial terms, the local self-government has become richer only on paper, and the burden of their obligations has increased significantly. The share of own revenues of local budgets (without transfers) in the consolidated budget remains low. For 2019, it will be 22.5% (in fact, for 7 months of 2018 - 21.8%), whereas in 2013, before all reforms on decentralization, it was 23.8%. 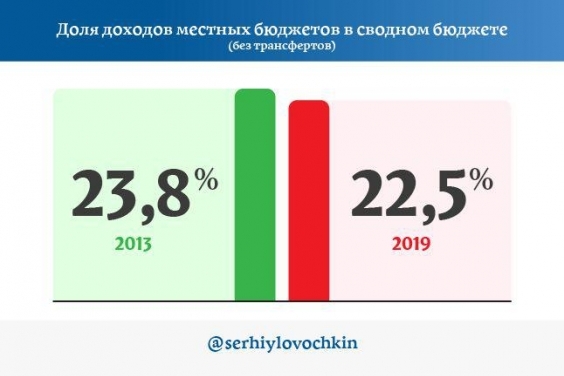 The total “resource” of local budgets (own revenues and balance on transfers) in 2019 should increase by only 7.6% or UAH 41.8 billion – up to UAH 588.9 billion, which will not cover the expected inflation (will be at least 9 %). The Ministry of Regional Development openly admits that a quarter of the united territorial communities, formally recognized as valid, in fact, cannot cope with their obligations. Currently, medicine is in a special risk zone, and its expenses are systematically underfunded at the local level. Financing of medical subventions is reduced by UAH 3.9 billion – from UAH 59.4 billion in 2018 to UAH 55.5 billion in 2019. In addition, in 2019, additional subsidies for the implementation of the costs transferred from the state budget for the maintenance of educational and medical institutions (from the planned UAH 16.5 billion in 2018 to UAH 14.9 billion in 2019) are planned to be cut by 10% or by 1.6 billion UAH. This grant is used to partially cover the costs of local budgets for the payment of utility services and payment of salaries to technical staff – expenses that were previously covered by the basic medical or educational subvention, and starting from 2018, they have been transferred to the local level. At the same time, the tariffs for gas and other utilities for public institutions, as well as the cost of labor, in 2019 will continue to grow. At the same time, the draft State Budget-2019 continues the “tradition” of 2015–2018 on the transfer of social infrastructure facilities, educational and medical institutions from local budgets. Thus, in 2019, the obligation to finance 69 technical schools and colleges (universities of I-II level) will be transferred to the local level, including 10 - the Dnipropetrovsk region, 9 – the Zaporizhzhia region, 6 – the Donetsk region. According to the calculations of the Association of Cities of Ukraine, published together with the draft State Budget - 2019, the educational and medical subventions are underfinanced totally by UAH 11.8 billion. Nearly two hundred newly formed united territorial communities do not have enough resources for high-quality and affordable medical, educational and administrative services for local residents. What additional opportunities for local development can we talk about when the reform of decentralization is accompanied by the “optimization” of schools and hospitals? In the process of the formation of the united territorial community, more and more legal conflicts and contradictions arise. One of the most illustrative examples is the recent “demarche” of the Central Election Commission, which refused to call the first election in the newly formed united territorial communities without explanation of the relevant committee of the parliament. Such a decision of the CEC is a complete absurdity, because the previous three years, the CEC itself, called elections in other united territorial communities without further clarification. As a result, these united territorial communities turned into “hostages of the CEC” and there is the risk not to receive the money promised by the state in 2019. Instead of combining the efforts by local authorities, such “reforms” provoke conflicts between local authorities at different levels. Regional councils authorized to approve draft long-term plans for merging territorial communities, form the united territorial community at their discretion and often ignore the methodological recommendations and calculations. District councils conflict with united territorial communitt for legal personality and property in the territories of the respective districts. This is especially pronounced when the united territorial community is formed according to the formula “one district – one community”. Indeed, under these conditions, district councils literally become an “extra link” in the system of the local self-government. Decentralization in this form has not solved the problem of local power dualism. Regional and district councils have not received the right to form executive committees. The leaders of regional and district state administrations, appointed by the top level of the authorities, continue to concentrate maximum powers in the local level. Regional state administrations develop draft long-term plans for the unification of territorial communities and have a casting vote in the application process for the State Regional Development Fund. Moreover, a Regional state administration distributes educational subventions from the state budget to local authorities, including the united territorial communities. Is it possible to call this direct budgetary relations of the united territorial community with the state budget? The problems are getting more, and it is already quite obvious that the current authorities will not be able to address them. Others will carry a full decentralization and another way. First, the regional and district councils must finally get the right to form the relevant executive committees. This is the basic condition for the liberation of communities from the dictates of the central bureaucracy. Secondly, the expansion of the financial base of local self-government for the implementation of new powers is necessary. In particular, through changes to the Tax and Budget Codes for additional decentralization of revenues from taxes and fees. Thirdly, in the course of real decentralization, it is necessary to substantially adjust the powers of the central authorities. This should be done so that the situation with the education reform does not repeat. All issues on financing this sphere were transferred to the local level, but at the same time, they did not restrict the Ministry of Education in the right to turn the system “upside down”. It is important in practice to ensure the participation of citizens in the solution of important issues for the community and the region, primarily of a socio-cultural and humanitarian nature. Issues of languages, cultural and historical heritage must be addressed in local referendums and plebiscites. To do this, the appropriate laws must be adopted. These directions are considered by the Opposition Bloc as key in the future reform of local self-government and the decentralization of power.